So, you’ve had enough of the overfilled warehouse of previously used industrial equipment and surplus MRO (maintenance, repair, and operations), However, you know better than to just scrap or throw out the equipment. Selling used industrial equipment and surplus MRO can be quite lucrative if you know what you are doing. While many people will claim to have their industry secrets on how to sell their surplus equipment, we have found there are some consistent factors that help improve the likelihood of selling the equipment as well as potentially maximizing the return from the sale. Taking a little time to properly plan the sale of your industrial equipment helps ensure that you'll turn a tidy profit while protecting your company's bottom line. Here are six tips to help you get through the process successfully. The first step you should take when looking to sell used and surplus industrial equipment is cataloging. Cataloging will allow you to create an itemized inventory of all the equipment and parts you have on hand. By taking the time to itemize and catalog your surplus you gain a much better picture of your next tasks. When reviewing your items, it’s important to consider all possible locations your surplus may be stored. Make sure you check supply closets, warehouses, and even on the production floor. The last thing you want for your catalog is to have crucial information omitted. Another important factor is other potential offsite storage locations. Perhaps your business has multiple production lines across many different locations. It’s best to take complete inventory across all different production lines and locations. Once you've calculated these figures, it becomes much easier to move your equipment in an orderly fashion. If you have machinery that requires a very specific environment that is expensive to maintain or that requires expensive maintenance even while in storage, that should be among the first items to go. You can then work your way down the list to save money in operations while maximizing the profitability of every sale. What is your equipment currently selling for and what is the market like? If your market is currently in a rut and your equipment is specialized to that market, you may not realize as much of a profit as you would like, but the sale may allow you to better position yourself to ride out the difficult times until things improve. If your market is doing well, there may be high demand for your equipment. This would allow you to liquidate more machinery, and with these new funds this can be used to spend on many things such as new equipment with modern feature such as IoT connected equipment allowing or similar upgrades to your operation. Similarly, it's important to know what your equipment is worth before trying to decide upon an asking price. For especially expensive machinery, it may be worth considering having an equipment appraisal performed to determine value. This gives you an additional document to base your side of the negotiations on, ensuring that you'll be able to get a strong price during the process. If you pulled onto a car lot to buy a new vehicle, would you buy the dingy, dinged-up Toyota in the back lot or the shiny vintage roadster sitting up front? Though it's not always accurate, there's a bias that the prettier piece was better cared for. If your equipment is in poor condition, dirty or unorganized, you're guaranteed to lose possible return on your machinery sale. It's important to invest a little time in the process of cleaning, repairing and organizing the equipment to provide its best possible face to the world. If your machinery is greasy, consider deep cleaning. If there are fine scratches on the surface, consider the old computer refurbisher's trick of adding a quick gloss of automotive wax to the surface to help improve its appearance. Are there repairs that can be made without breaking the bank? 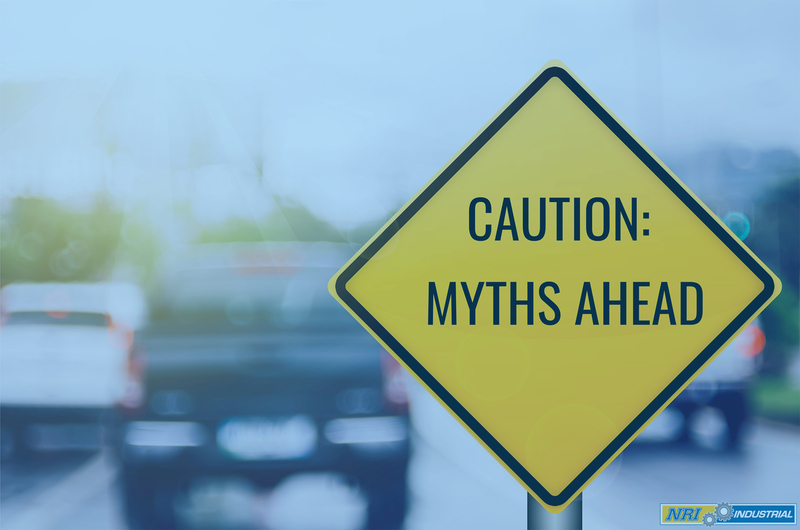 When selling used industrial equipment or surplus MRO slight cosmetic discrepancies are often overlooked in the sales process as long as the function of the equipment or the part is still in proper working order. You'll often see a strong return on your investment by simply taking a few minutes to improve the appearance of your equipment before you sell it. However, don't use this tip as an excuse to cover up potential issues with the machinery, or you'll have problems with your buyers down the road. If a picture is worth 1,000 words, what is it saying about your equipment? To get attention when selling industrial equipment, you need to take the right pictures. Fortunately, doing so won't require an obnoxiously expensive camera or professional photographer! There are just a few things to keep in mind if possible. Work with natural light when possible, or at least diffuse the light you're using to prevent harsh shadows and angles. Either photograph the equipment in front of a plain wall or hang a sheet or backdrop behind it to hide any other equipment to prevent confusion over what's being sold and make the equipment the centerpiece of the photo. If you don't have a tripod, rest your arms on something steady or against a post or wall to prevent blurring. Set up your camera to take high-resolution pictures, which will take more space on the memory card, but allow the potential buyer to zoom in on the details they want to see. Always take pictures of specification tags, which provide the potential buyer with information about your equipment. Take pictures from every angle, especially those that the buyer may be interested in, such as showing the machinery's inner workings or functional portions. Make sure to document any issues with the machinery, including blemishes or damage. Finally, consider learning a little about photo editing to improve your pictures after they're taken. There are a few different factors that will impact the return on your equipment sale, including the time frame you have available, your level of involvement, the cost of that method of sale and the return on your equipment. There's no single method that will always provide the strongest return, so it's important to look at the advantages and disadvantages of each option. The affordability of storage, cost of maintenance, demand for the space being used for storage and similar issues must be examined fully. You have several options available for selling surplus industrial equipment, including liquidation, which is fast but often unprofitable, direct sales to private parties, who can be difficult to track down, selling to a dealer, who may have their own interests ahead of yours, or selling in a live or online auction. If you're not quite sure which method is the best for your situation, it's best to consult with a professional firm that handles used equipment sales. Today's equipment buyer wants the process to be easy. The more information you provide for them at the beginning of the process, the more likely they are to purchase your equipment. Think back to the last time you had to make phone calls or send emails to try to find something out on something you were going to buy. You almost certainly considered going with an easier website or business where you could simply place your order and be done. When you're trying to sell industrial equipment, you'll want to make the process easy as well. You should always include as much information on the equipment as possible. Add links to the specs if you can't post them on the page itself. List the brand name and model number to make it easy to reference. Add information about operating hours and maintenance logs. If there are any issues with the machinery, even if it's simple scratches or dents, make sure to include them as part of the listing. This makes it easier for the potential buyer to have all their information in a single, easy-to-reference location. Still finding the task of selling surplus and used industrial equipment daunting? You are not alone. This process at times can be extremely difficult and challenging to manage. This is why many other companies look to bring in outside expertise and help on matters like this. These companies have one job, to maximize the potential return of used industrial parts and equipment. While hiring these companies come with costs associated with the sale ultimately this cost could still help earn more potential return. 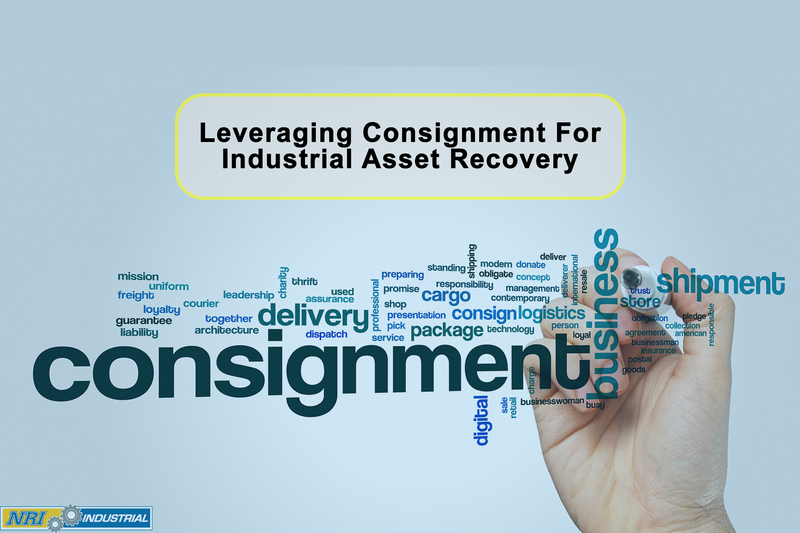 A strong asset recovery firm will have multiple selling techniques and channels helping you not only maximize your potential return but also allowing for the operations of selling the equipment to go much smoother. 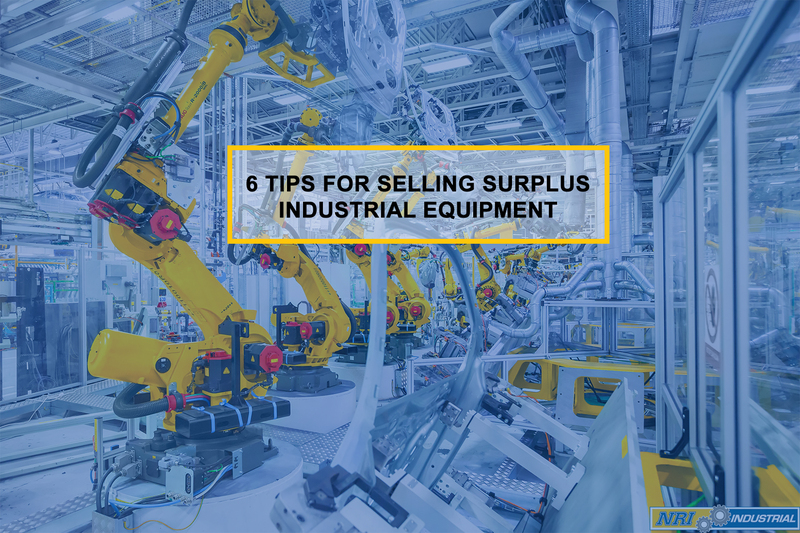 By taking these tips into consideration when you're going to sell industrial equipment helps you ensure that you'll maximize the profit you can make from the process while making it move as smoothly as possible. However, just as important to how you're selling your equipment is who you're selling it with. 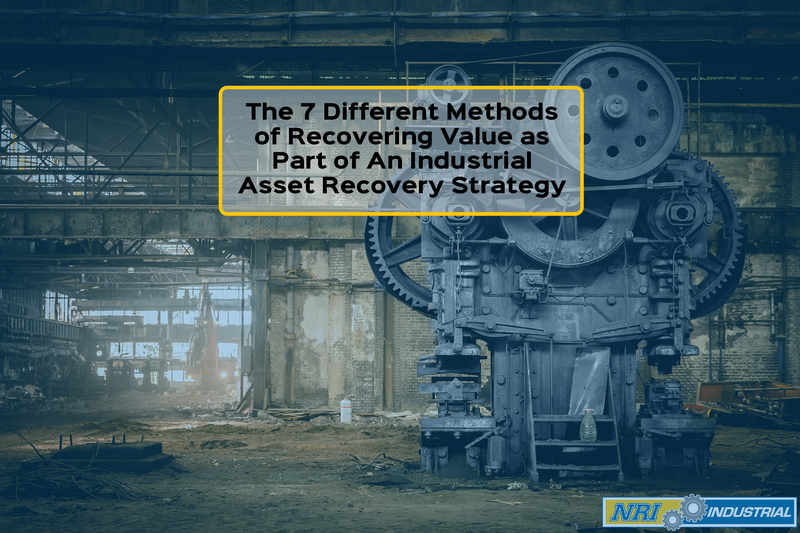 With over a decade of experience as an industry leader, NRI Industrial can help you develop and execute a solid asset recovery strategy to ensure your company moves forward in the best possible condition to take advantage of market conditions. 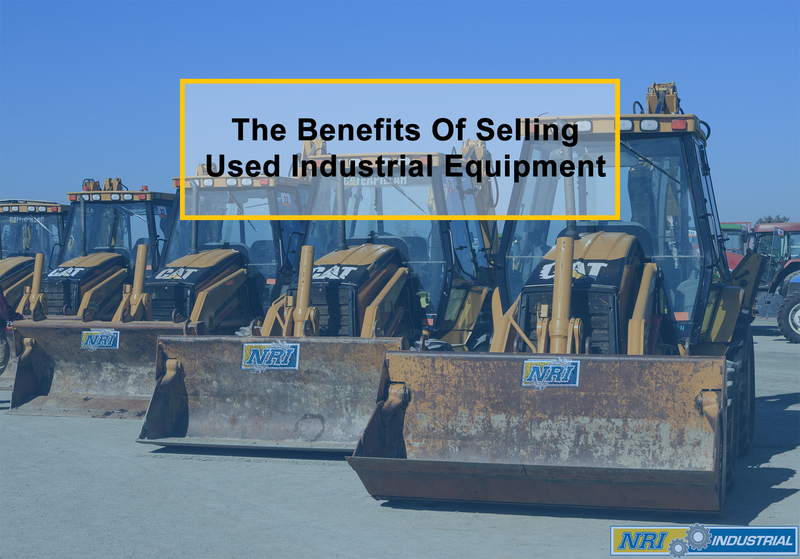 If you'd like to find out more information about selling industrial equipment and surplus MRO, or if you have any additional questions you'd like to discuss with someone in a little more detail, contact NRI Industrial by calling 1 (855) 709-9813 or emailing: Solutions@NRI-ISD.com. Not ready to talk yet? Not a problem! Instead, learn more about asset recovery by reading our latest article on How to Sell Surplus MRO & Used Industrial Equipment.